Classes have just ended, and you know it’s that time of the year again—workshop season! Don’t pass up on the chance to channel your very own Glinda or Jean Valjean by signing up for theater classes this summer. Passionate for all things theater, eager to learn more about the industry, or just bored out of your wits? Here we’ve rounded up 7 theater workshops you can join this summer! 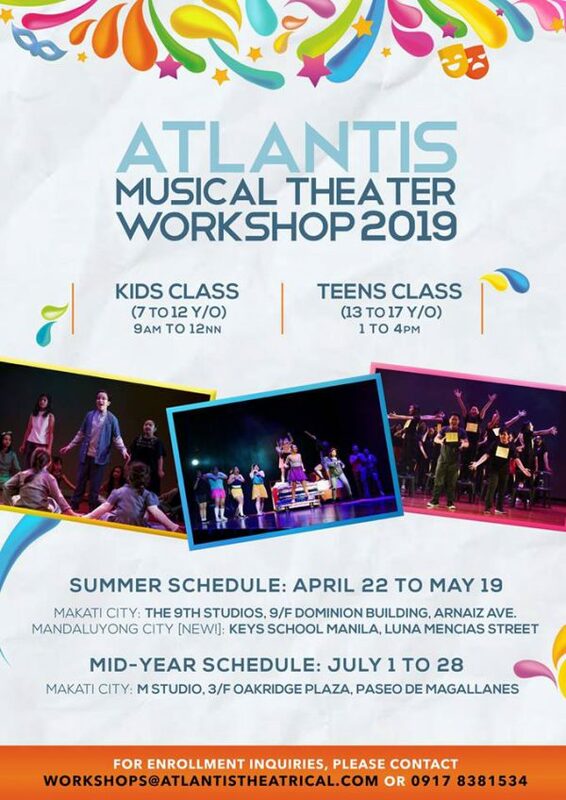 Now on its third year, the Atlantis Musical Theater Workshops for Kids (7–12) and Teens (13–18) is back bigger than ever! This month-long workshop will take you through the fundamentals of acting, singing, and dancing for musical theater. All classes will be spearheaded by Atlantis veterans Steven Conde, Sarah Facuri, and Mica Fajardo, providing you the experience of learning from and working with the country’s top theater professionals. 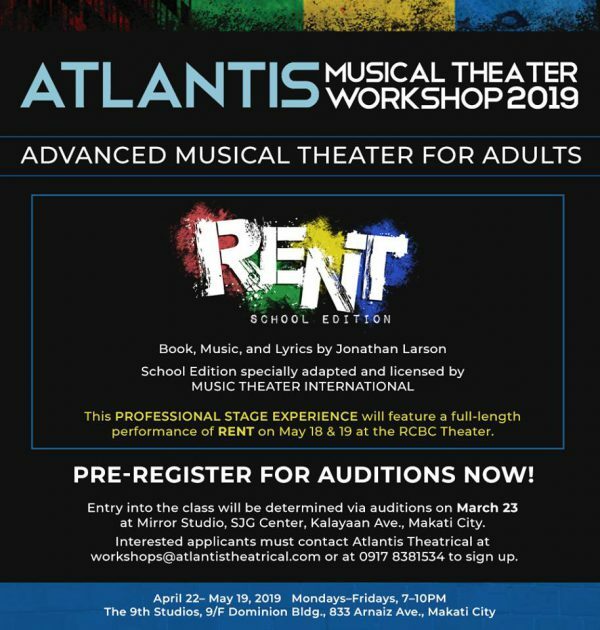 As a special treat for its 20th anniversary, Atlantis will be staging a fully licensed and professional production of RENT School Edition, through its Advanced Musical Theater class! This production will be staged at the RCBC Theater on May 18 and 19, 8pm, directed by Steven Conde, with choreography by Cecile Martinez. For inquiries and slot reservation, email workshops@atlantistheatrical.com or contact (0917) 838 1534. You can also call Keys School Manila at (02) 727 9357 and (02) 723 4979. You can also follow ATLANTIS on facebook.com/ATEGasia or visit www.atlantistheatrical.com for up-to-date information. 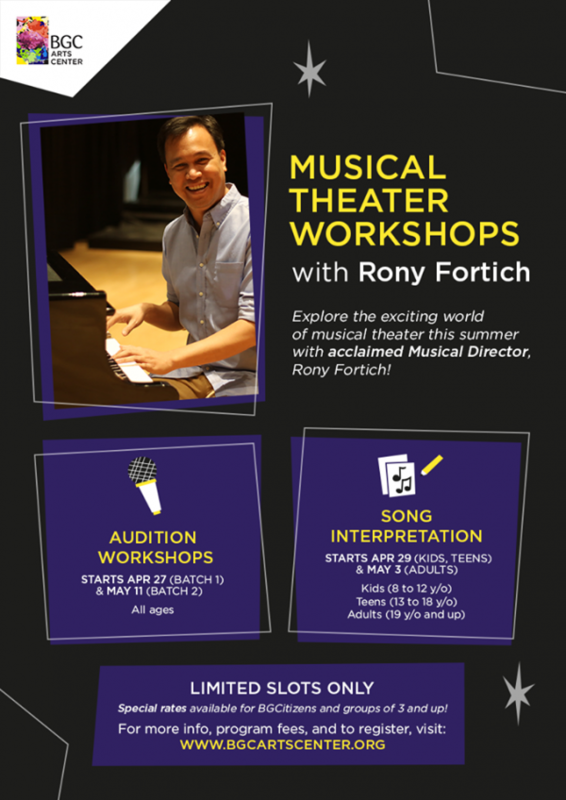 The acclaimed Musical Director, Rony Fortich, is back with yet another season of in-depth workshops for aspiring musical directors, performers and theater enthusiasts! There will be Song Interpretation workshops, for analyzing how each musical piece ticks, and Audition workshops, for bring out your best in front of a panel! For more details, visit https://www.bgcartscenter.org/whats-on/143/musical-theater-workshops or email programs@artsatbgc.org. Kids Acts Philippines, or KAPI, is the premier children’s theater company in the Philippines, founded by two award-winning Filipino Directors – Luigi Nacario, and Eugene Belbis. Through its TheCampArt Performing School, KAPI provides workshops and trainings on acting, music, and singing to kids during the summer, following an international syllabus for theater education integrated with its own acting approach called the S.A.F.E. Acting Technique. There will be several classes open this summer to help unlock each participant’s potential—Kinder Theater (3-7 years old), Children’s Theater (8-10 years old), Junior Theater (11-13 years old), and Teen Theater (14 years old and above). This summer, the workshop will feature a musical based on Snow White and the Seven Dwarves! 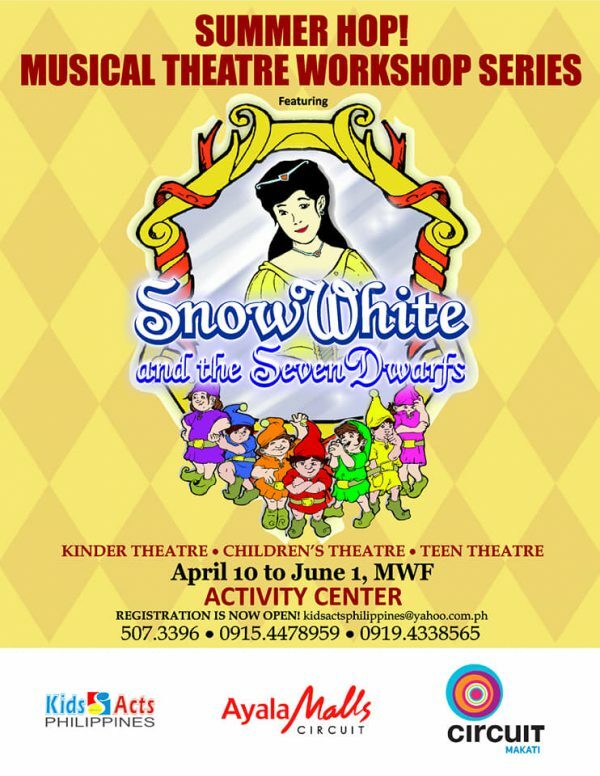 For more inquiries, contact them at kidsactsphilippines@yahoo.com.ph or call (+632) 507-3396, +63 915 447 8959, or +63 919 433 8565. 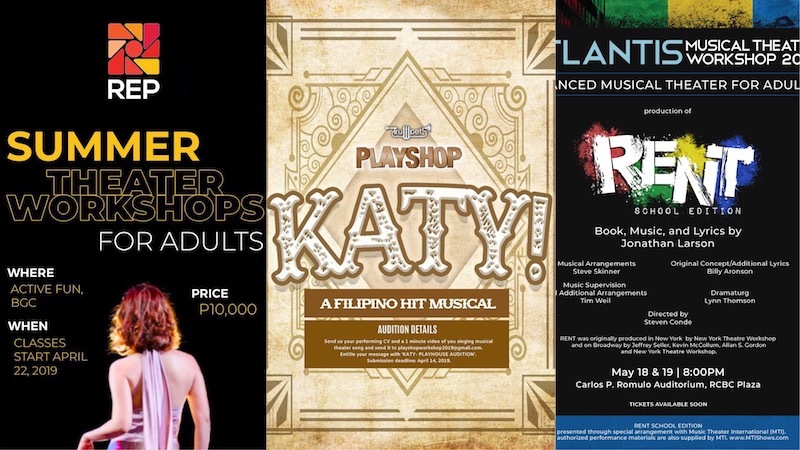 The Philippine Educational Theater Association (PETA) is back this summer with eight intensive theater arts courses for its annual summer workshop, ranging from children’s theater to acting classes for adults. This will provide you with an opportunity to tap into your limitless creative potential, allowing you to perform under the limelight and in front of an audience. Facilitated by some of the country’s most outstanding thespians and theater practitioners, PETA has always been a go-to every year for its unique, comprehensive and student-centered programs. Immerse yourself in the theater and learn the rudiments of the industry through PETA’s many programs, ranging from Integrated Theater Arts to musical theater! 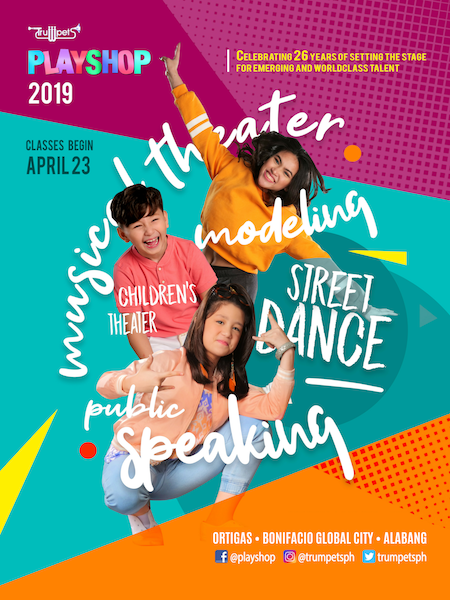 Interested enrollees may drop by the PETA Theater Center at between Tuesdays to Saturdays or contact PETA through Jill Raz at jillraz@petatheater.com, (02) 725 6244, or 09178042618. Interested applicants can also schedule an interview schedule via www.bit.ly/PETAWorkshops. 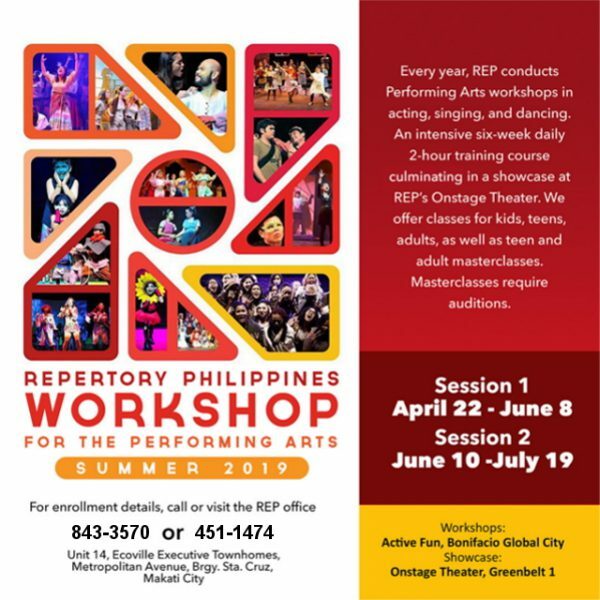 Unleash your inner Idina Menzel or Ben Platt by joining this year’s REP Workshop for the Performing Arts. Learn from some of the country’s most outstanding thespians and discover new skills on and off the theater stage. Children will be able to get a holistic and interactive training in REP’s Kiddie Classes which are open for children aged 5 to 8 years old. Kids aged 9 to 12 years old can join the Pre-Teens Class, while 13 to 16-year old students can enroll in the Teens Class. Those who have an acting experience may audition for REP’s Junior Masterclass, headed by director Joel Trinidad and Nicky Triviño. Adults can also get in on the action! Tap into your creative side in the Adults Class, open for people aged 17 and up, under the tutelage of renowned stage veteran Maynard Peñalosa. There will be an Adults Masterclass as well, to be facilitated by stage actor and director Jeremy Domingo. Opening this summer is the Triple Threat Masterclass, which teaches various techniques to handle the strenuous trio of musical theater: acting, singing, and dancing. With a ballet, jazz, and tap foundation, participants will also get to train hip hop, flamenco, and even production work! For inquiries, you may call REP at 843-3570. If you are interested in applying, you can download and print the form from www.repertoryphilippines.ph and send it in to REP by fax (555 0082) or email (repphilfoundation@gmail.com). In collaboration with the De La Salle Araneta University, Tanghalang Pilipino brings back its DESK (Dalubhasaan sa Edukasyon, Sining, at Kultura) Arts Masters Classes in this year’s Kamalayang Pilipino. With speakers including National Artist Bienvenido Lumbera and Dr. Nicanor Tiongson, this summer camp aims to enrich arts education, especially for instructors and educators of arts and culture. It’s open to artists young and old, cultural workers in government and non-government organizations, and everyone who has a love for Philippine arts and culture! Lecturers will include Dr. Ramon Santos, Professor Steve Villaruz, Professor Imelda Cajipe, Professor Felipe De Leon Jr., and TP Artistic Director Fernando Josef. The camp will be facilitated by Dr. Jerry Respeto, Prof. Al Bernar Garcia, Prof. Jocelyn Timbol Guadalupe, Dr. Joey Bacquiran, and Prof. Alice Pañares. If interested, please register at https://form.jotform.me/82892656698480. For inquiries, you may contact Jennifer Bonto / Remus Villanueva at remustanghalangpilipino@gmail.com or 09266165206. For 26 years, Trumpets Playshop, a trailblazer of summer workshops, has been a training ground for many local theater actors, and even some who have been making rounds on the international stage like Red Concepcion (Miss Saigon), Joaquin Valdes (Miss Saigon), and Christine Allado (Hamilton). With summer fast approaching, Playshop opens its doors to aspiring actors and dancers alike with its upcoming workshops: PLAYSHOP THEATER for theater and musical theater, PLAYHOUSE for advanced playshoppers, PLAYSHOP DANCE for hip-hop and streetdance, and PLAYSHOP POWER for modeling and public speaking & hosting. There will also be audition-based PLAYSHOP PREMIUM classes for advanced musical theater, and a script analysis masterclass with renowned writer and director, Jaime Del Mundo. 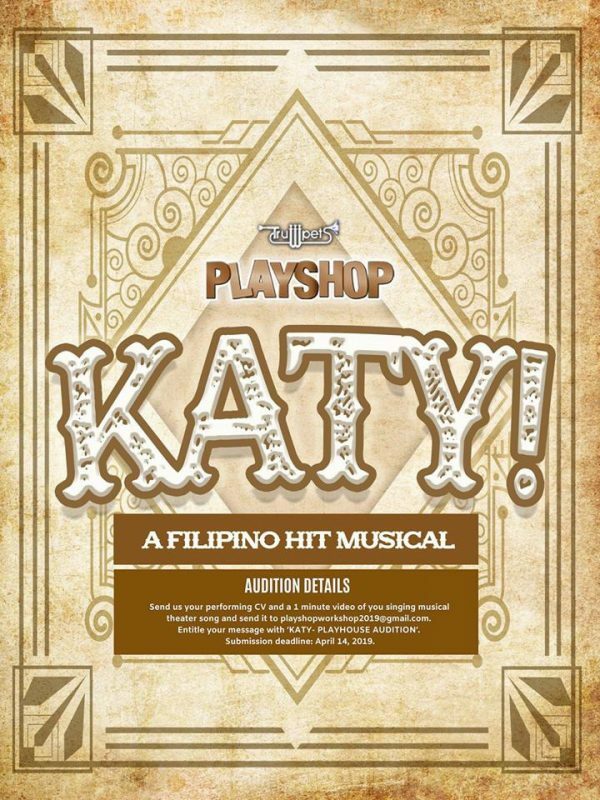 There will also be a 6-week Professional Musical Theater Program, which will conclude with a production of the musical ‘Katy!’, to be directed by Ed Lacson Jr., with choreography by PJ Rebullida. This program, open to teens and adults, will also include curated master classes to be led by some of the industry’s top professionals, including Audie Gemora and Diohanna Tiongson. For inquiries, you may email them at playshopworkshop2019@gmail.com. You may also reach them at their social media accounts or call them at 818-1111 loc 254 or 0917-586- 4177. Next #TFM8for8: Win tickets to musicals!